In september 2016 Elevate had a session to create its own Team Canvas. The Team Canvas is a tool that is quite popular with our customers. It helps in defining business goals, purpose and commitments for a specific time frame. But at the same time there is time to talk about the “softer” things like personal needs, expectations and personal goals. So at the end it provides you with a canvas you can put on the wall and use as a recurring topic to discuss. Using the Team Canvas as a guideline, we have developed different exercises and use tools in the area of personality / natural preferences to provide a full day program in which teams build their own canvas. So, if we use a tool with our clients we should use it ourselves as well (practice what we preach). Although the canvas consists of 9 blocks, we focus on values for now. 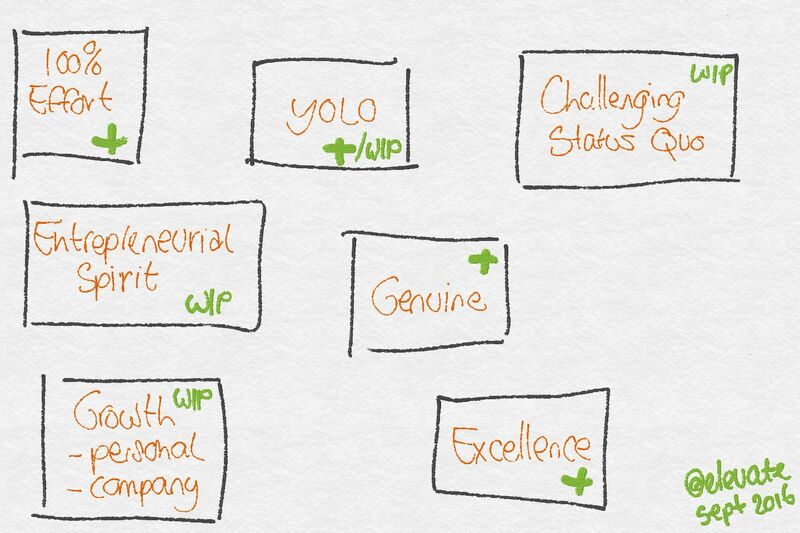 We would like to share with you how we decided upon the Values that are currently the most important for us as a team. We start with a huge stack of cards. Each card has a value written on it. Each teammember selects 3-5 cards (depending on the size of the team) reflecting values that are important to him/her in the cooperation. All selected cards are put on the table. Teamdiscussion starts: on which 8 values can we agree? Usually there is some clustering of values that might represent about the same. Semantics often decide (“this sounds better, more suitable” etc). Furthermore it is important to look at the final set and see if it is diverse and reflects all aspects of working as a team. For us, we didn’t feel the selection led up to a complete set. So we created 2 additional values ourselves. Next step was to define which values are currently present and reflected in the team versus values that will need some more effort and attention. So each value is marked either with a + or with a WIP (work in progress). Stuff to put on the agenda. Also to discuss what kind of behaviour we expect when talking about these values.